NEW YORK (CNNMoney.com) -- Microsoft Corp. unveiled a new operating system for mobile phones Monday, marking its latest move to reclaim a leading position against rivals Apple, Research in Motion and Google. Just a few years ago, Microsoft (MSFT, Fortune 500) was embedded in about a quarter of all smartphones sold. It's now in less than 10%, with competition coming from the iPhone and BlackBerry. Google (GOOG, Fortune 500)'s Android has only made a crowded space even tougher for Microsoft. Microsoft's new operating system is made up of "live tiles" that are updated in real time. Now, after months of speculation, Microsoft has confirmed that 7 will be a tiles based interface and include live access to Facebook, plus its own offerings X-Box Live for gaming and Zune for music and photos. Its search engine Bing is also included. Microsoft says it looks like nothing on the market and the advantage lies with consumers gaining instant access to all these offerings on their smartphones. 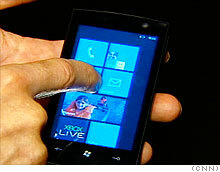 Microsoft CEO Steve Ballmer told CNN that this is a major push for the company to get back in the mobile space. He said 7-based smart phones will be manufactured by the likes of Qualcomm, Samsung, LG, HTC, HP, Dell, Sony Ericsson, Toshiba, and Garmin-Asus. The variety of hardware partners will provide customers with choice in a "one size does not fit all" mobile world, said Microsoft's senior vice president of mobile communications business Andy Lees. For instance, he said, some phones will be equipped with keyboards, while other will not. But all phones running the new operating system will include certain features, such as 4-point multitouch. Lees said Microsoft will reveal the range of phones closer to the holiday season launch. The phones will be available on multiple networks, including T-Mobile, Sprint, and Verizon, as well as international carriers such as Telefonica, Vodafone, SFR, Telestra and Telecom. Lees said carriers will be able to enable their own innovations, software and services to work with the Windows operating system. He added that Microsoft has "deeply engaged" partnerships with AT&T, which launched the first Windows Mobile smartphone in the United States 2003 and is the exclusive carrier for Apple's iPhone. Lees also called out Microsoft's partnership with France Telecom Group's Orange, which introduced the first Windows-based smartphone phone in 2002. The features of the new operating system are a "step in the right direction," said Todd Day, mobile and wireless at Frost & Sullivan. But he cautioned that Microsoft's business model could wind up being an obstacle to the success of the 7 Series. Unlike Google's Android, which is open source and available to manufactures for free, Microsoft requires handset makers to purchase licenses. "The revenue model is shifting, and it could be a real catch that Microsoft's system charges licensing fees when everyone else is offering open source operating systems," said Day, adding that mobile operating systems generate profit through advertising sales and search revenue. Despite the criticism, Ballmer said Microsoft has no plan to alter its model. "I think there's something clean and simple and easy to understand about our model: we build something, we sell that thing," he said during the Web cast. "My parents, like most other parents, say, 'When something is free, you take a look and find out where the real cost is.' Our plan is clear and direct, and we plan on staying with the model we're on." One way Microsoft can compete, Day said, is by connecting its mobile operating system to its PC operating system. "Right now, the mobile product is a completely separate product from Windows 7, but I wouldn't be surprised to see them integrate the two, and I think it would help them," Day said. "Documents on your home computer would be accessible through the cloud on your Windows mobile phone, and the look and feel would be similar so users could interact with their phones like they do with their their computers at home." The Windows Phone 7 Series' software experience is designed to "fundamentally focus on what's most important to each individual user," said Joe Belfiore, Microsoft's corporate vice president for Windows Phone Program Management, during a Web cast from Barcelona. The operating system's start screen is made up of several "live tiles" that are updated in real-time. So instead of seeing an icon for a Facebook application, Belfiore explained that users will be able to browse through their contacts and get live updates from their Facebook, Windows Live and other social media services in one hub, without moving in and out of various applications. Users will be able to create live tiles on their start screens for contacts to get constant updates for certain individuals. Though the iPhone has been outselling the Windows Mobile devices for two years, it recently beat Microsoft in terms of active smartphone users, according to data from comScore. At the end of 2009, BlackBerry continued to hold the lead with 41.6%, followed by the iPhone with 25.3% and Microsoft came in third with 18% of the smartphone market share. While Google (GOOG, Fortune 500)'s Android still ranks fifth behind the Palm, its market share climbed the most during the fourth quarter, rising to 5.2% from 2.5% in September. -- CNNI's Jim Boulden contributed to this report.